This day was a personal highlight. 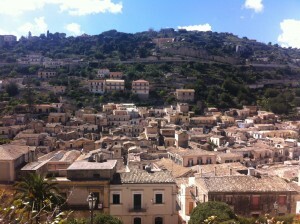 We drove to Modica, a small town on the top of a hill best known for its unusual, grainy chocolate. Like many of the towns we visited, Modica has been under the rule of Greeks, Arabs and Romans, and the influence of each group is still visible. We ran up the hundreds of stone steps to the center of Modica Alta, where we had an amazing view of the valley, Modica Bassa and the ocean. 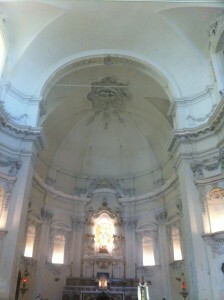 At the top of the steps is a baroque cathedral, the duomo di San Giorgio, and a maize of cobblestone streets. We learned that in the nineteenth century aristocrats from the surrounding area moved to Modica Alta, pushing the less wealthy to Modica Bassa. We left Modica for Noto, a baroque town that was almost completely rebuilt in the nineteenth century and again following an earthquake in the 1990s. 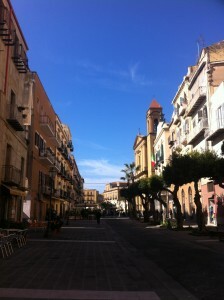 Unlike Modica, Noto was crowded with tourists. We visited the duomo, which was ornate and white in the Sicilian baroque, a stark departure from the decadent gold mosaics of the cappella palatina. On our way out of Porto Empedocle we stopped to see the town’s statue of the commissario Montalbano, a character from Camilleri’s novels and a television series, and to have coffee at the character’s favorite bar. The town of Porto Empedocle plays a large role in the Montalbano films we’ve seen, and we were excited to see it in person. We took pictures with the statue of the commissioner and admired the artwork in the piazza inspired by Camilleri’s writing. Our sunny morning in this town was a great way to start one of our biggest days of the trip: the Valle dei Templi, with some of the most important and best preserved Greek temples in Sicily. 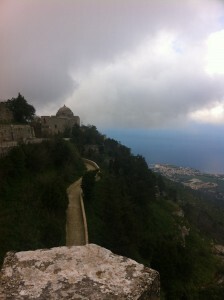 After a beautiful visit to Segesta, where we were among the few tourists and hiked through wildflower-lined paths to the Greek theater, Carmelo drove us to Erice, a beautiful town on a hilltop. A group of us joined Carmelo for a walk through the town, and he took us to a castle at the edge of the village, where we could see the ocean and miles of farmland. We had time to walk through the cobblestone streets before heading to Maria Grammatico’s dolce-making lesson and dinner. Maria Grammatico has been making marzipan sweets for over fifty years, and learned her trade from a group of nuns who lived in Erice. She taught us how to make marzipan fruit, tette di monace, and brutti ma buoni, and served us an elaborate dinner. Early the next morning, Mia, Michael and I headed out for a walk. A cloud had descended on the town and the fog was so thick that we could only see a few feet ahead of us. We didn’t see anyone else out so early, and the quiet and fog lent a dreamlike feeling to the village and its narrow streets. 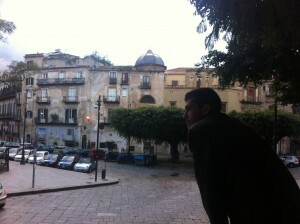 After a long day of travel, we were so excited to reach Palermo. We met our bus driver, Carmelo, who took us to an exhibit of the photography of Letizia Battaglia. Much of her work centers on the mafia, and it was a great introduction to what would be an important topic on our trip. We walked through the city and were struck by the beautiful abandoned buildings.